We aspire to be a company that ensures all employees are happy and that they have hope and good quality of life. We aspire to be a company that works on everything with sincerity to gain recognition and trust from customers. We aspire to be a company that maintains its ambition and achieves continued growth. 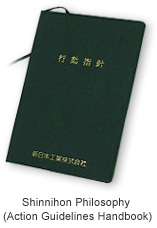 Shinnihon Philosophy embodies the management philosophy in the form of action guidelines. On the basis of the Shinnihon Philosophy, we go back to the fundamental principles whenever we face a deadlock in everyday operations. Always be optimistic and positive and do everything to the best of your ability. Always obtain the full participation of your colleagues and achieve convergence of aspirations. Always think of your colleagues and remain appreciative of them.